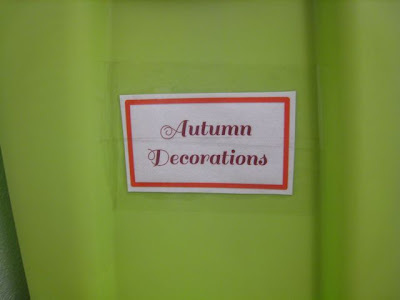 I made a deal with myself that I wouldn't put up our Fall decorations until I re-organized my holiday decorations closet. 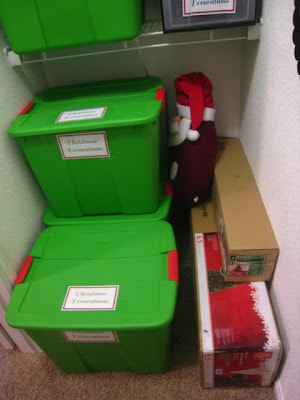 Yeah, I have a holiday decorations closet. Haha. Stuff everywhere! Teetering stacks of boxes! What you can't see behind that Christmas tree box on the left is a giant mess of wrapping paper, Christmas decor that wouldn't fit in the boxes, and random miscellaneous home decor stuff like candlesticks. Yes, I hid it behind big boxes. More teetering boxes! That cardboard one was dangerously close to the edge in order to avoid smushing the Fall wreath above, and the grey boxes were definitely not balancing well on the edge of that clear box, which meant that chaos would ensue every time I tried to retrieve any of the boxes. Wreaths in danger of toppling to the ground or being squished by boxes! Random stuff on the shelf! In the interest of full disclosure, this is actually a lot better than it once was. Everything used to be in assorted sizes of old cardboard boxes and shoe boxes and shopping bags (if only I had a picture of that!). For the last year or so I've been buying plastic bins for our holiday decorations and switching them from the cardboard boxes to the plastic bins when I put them away. 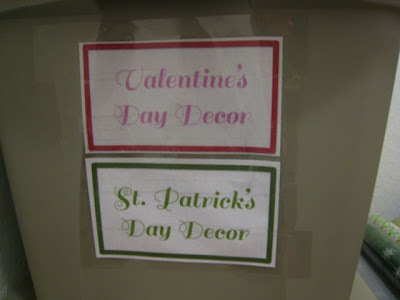 So that part was already done (so technically I did spend a few dollars each on the bins, but they were all on sale at either Home Depot or Target). 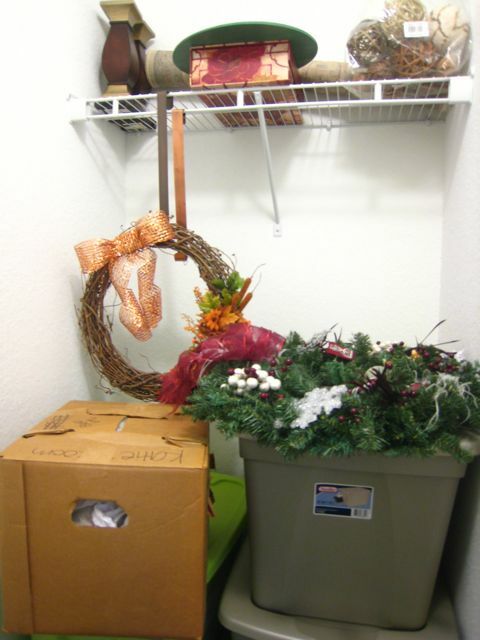 My first priority was to create a better solution for storing wreaths. 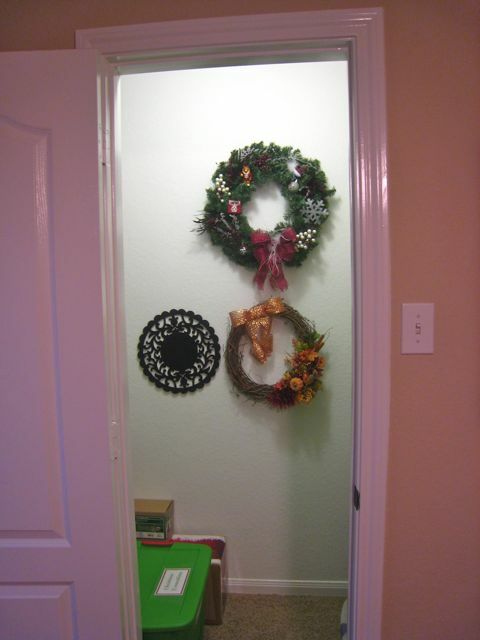 I hammered some long nails into the back wall of the closet, and I hung the wreaths (and one felt placement that I use for all sorts of things) up on the nails. Easy peasy. 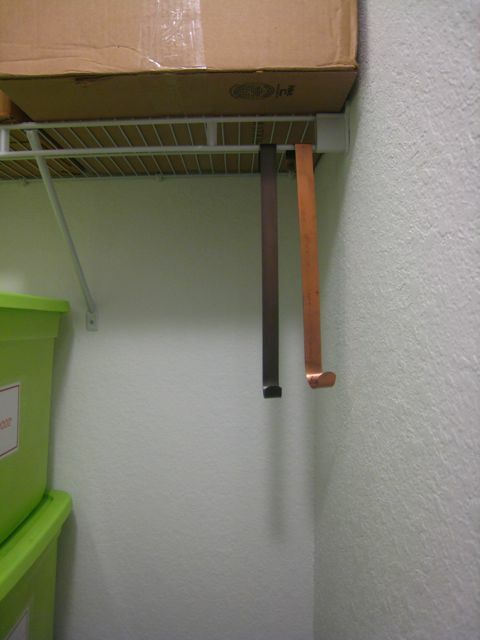 Storing them hanging gets them out of the way, plus they look kind of pretty! There's plenty of space for more on that wall as well, so I'll be able to add wreaths as I make more for various seasons! 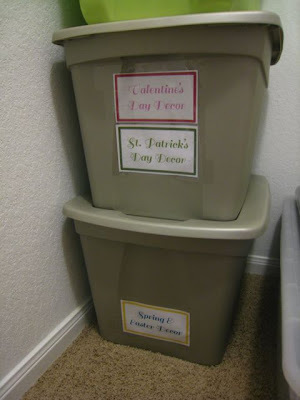 My second priority was to make better use of the bins. 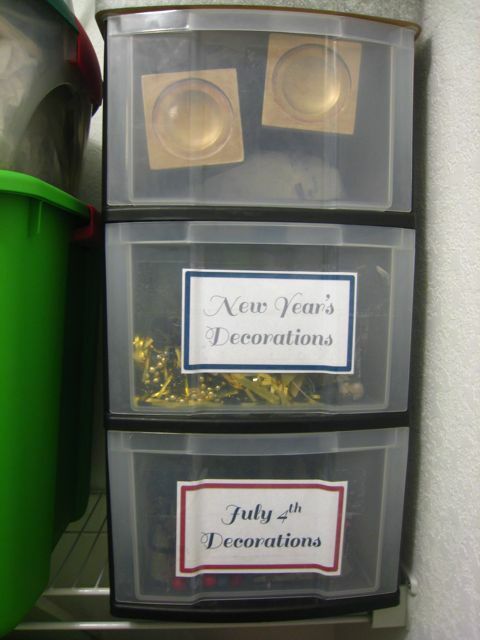 I used to store a lot of ornaments, decorations, etc. in their original boxes, and everything just took up too much space. 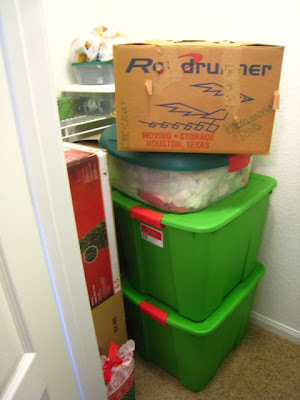 Once I got rid of the boxes and re-packed everything with just packing paper, everything easily fit into the plastic bins. By re-organizing, I was able to completely free up the shelf on the right side of the closet. I filled it to the brim with all my porcelain dolls from my grandma, as well as my childhood Bitty Baby doll (and her clothes/bassinet), which I'm saving for future generations. :) Prior to doing this, I thought they'd have to go in the attic for storage, so I'm really glad we can keep them in here out of the Texas heat. 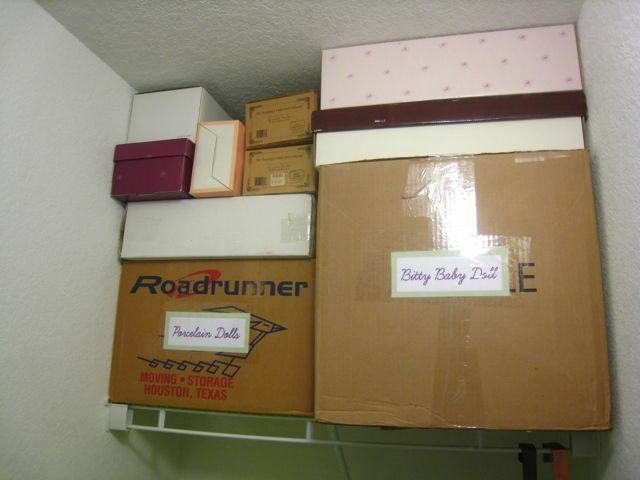 I printed some labels for the cardboard boxes so I know what's in them... "Porcelain Dolls" on the left and "Bitty Baby Doll" on the right. 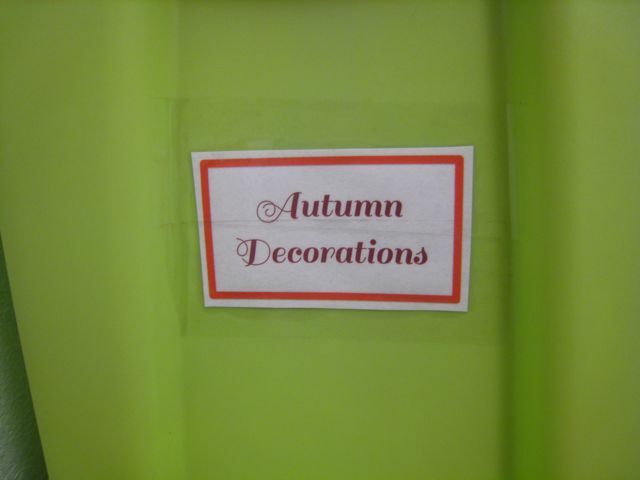 I printed labels for all of the decor bins as well. 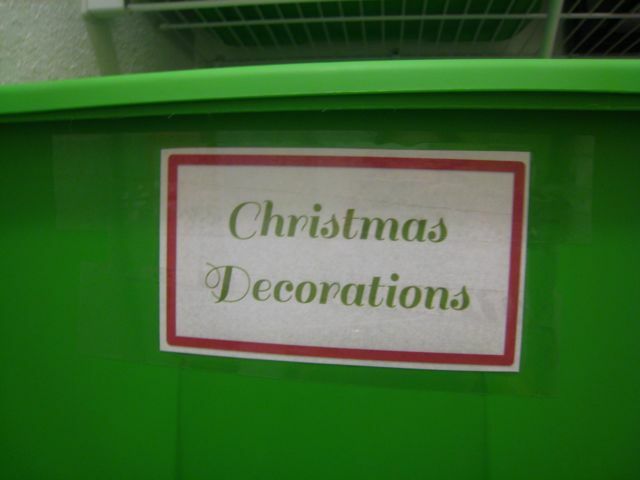 I just designed them in PowerPoint, printed them on our inkjet printer, and affixed them to the bins with clear packing tape to make them durable. Easy and free! 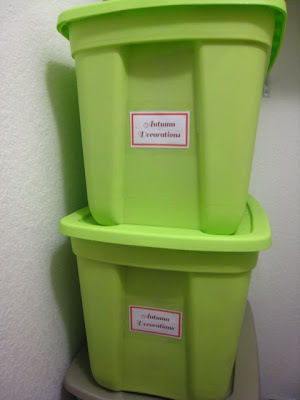 I printed three labels for each bin so I could put them on the front, side, and top. That way they're easy to identify from all directions! 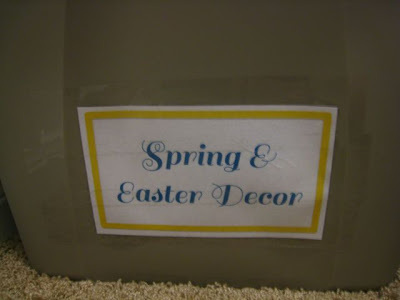 This is one of my new favorite fonts - "Sail"
I used to pack my wreath hangers in the boxes -- one with the Christmas stuff and one with the Fall stuff, but I was always digging for them when I happened to need one for some other wreath-using occasion, so now the two hangers are hanging in closet for super-easy access! 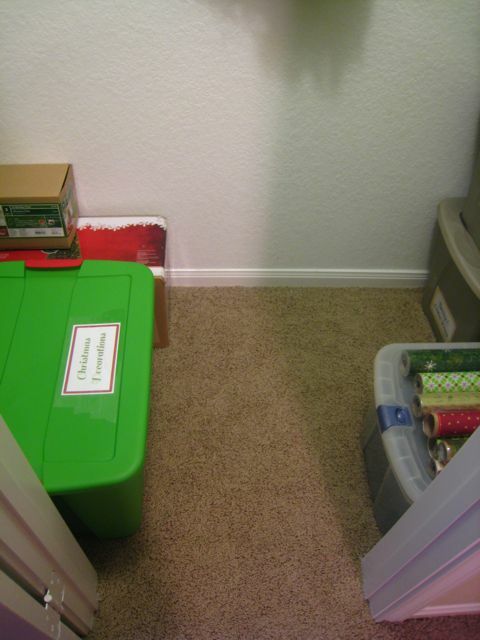 The left side of the closet is where all my Christmas decorations are now. 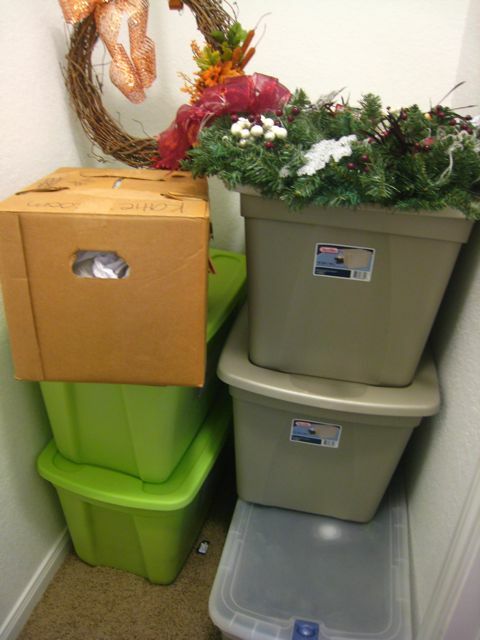 I got all the miscellaneous stuff off the floor, and now everything is contained in the plastic bins. They're all pretty full, so I figure I'll probably need to buy another green bin eventually. There's a nice space for one more on top of that one in the front though, so I have some room to expand! Our two Christmas trees are on the right side, in their original boxes (that seems to be the easiest way to store them), along with my Aggie Santa pillow (which couldn't quite fit into a plastic bin). 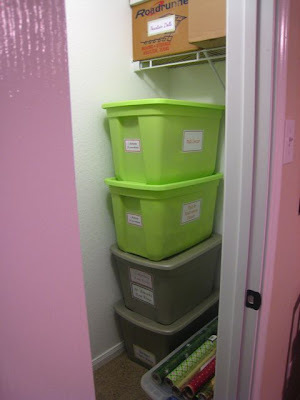 I had this little three-drawer cart in my craft room before we started the big craft room re-do. I don't need it in there anymore, so it found a new home in this closet. It fits perfectly on the shelf (a convenient surprise!)! I don't have many decorations for July 4th and New Year's, so those holidays each got a drawer. 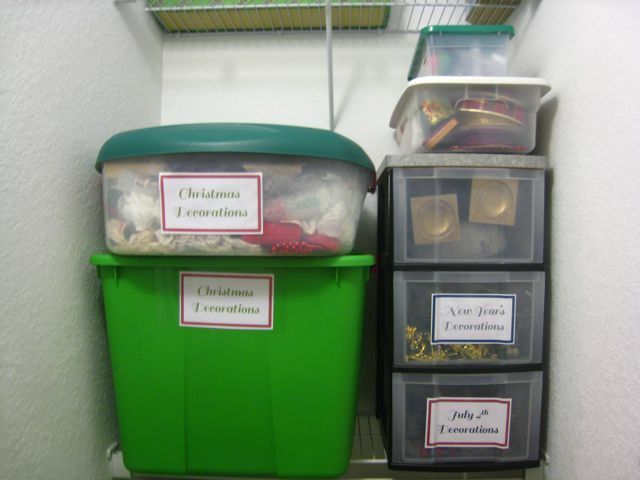 The top drawer holds some candlesticks and other things that I use year-round for lots of holidays (but don't use in the house on an everyday basis). The best part of this whole job is this next picture -- there's space on the floor to walk in!! Now I can walk in there and turn to one side or the other and easily find what I'm looking for, and I'll actually have space to pull the bins out without bumping into stuff and sending wreaths flying toward the ground! Now everything in the closet has a place, and nothing is in danger of falling/getting squished/being broken. For zero dollars and an hour or two of work, I'd stay it was well worth it! 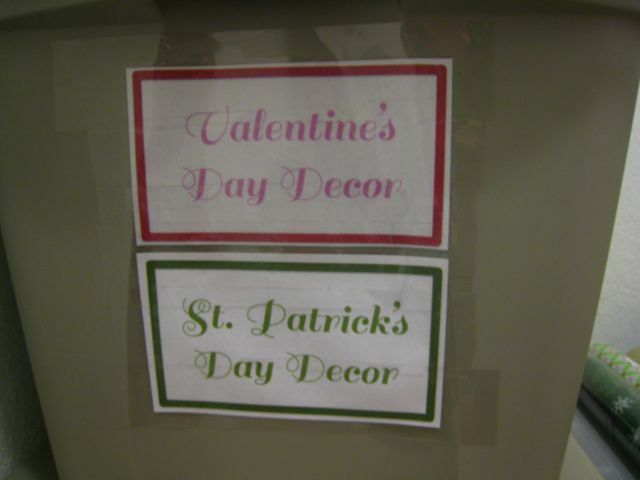 Wow, I am so impressed with your holiday decor collection! Once I get our new little home spruced up mostly the way I'd like, I am going to finally tackle some of the holiday crafts that have been sitting in my pinterest boards forever. California Trip - Day 5: San Francisco!